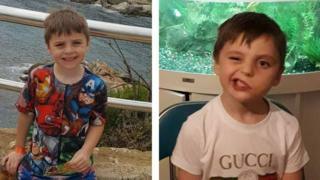 A six-year-old boy has been left with a fractured skull and a paralysed face after an arcade game fell on top of him on holiday, his family say. Oscar Donnelly also suffered a punctured lung in the incident in Lloret de Mar, Spain, in September. His parents, from Cardiff, are taking legal action against Aparthotel Costa Encantada for failing, they say, to secure the six-foot darts machine. Aparthotel Costa Encantada has been asked to comment. Doctors battled to save Oscar's life for three hours before he was placed in an induced coma and put on life support as they monitored a bleed and swelling on his brain, his parents Luke Donnelly and Samantha Matthews, claim. Following the incident, which the family believe was triggered by vibrations from a nearby punch bag arcade game, Oscar's parents said he was left with a series of injuries and conditions. These include diabetes insipidus, a rare life-long disorder which means his body cannot retain enough water; an eye condition which means he cannot blink; and facial paralysis. One of Oscar's older brothers witnessed the incident and alerted his parents. Ms Matthews, a care worker, said she feared her son had died after he was admitted to hospital in Girona. "We were taken up to intensive care, still not knowing if Oscar was alive," she said. "We broke down thinking the worst as we were led into the family room and they told us that it was 'not looking good'." Mr Donnelly, a welder, said Oscar had changed from being "confident and bubbly" to "frustrated, tired and confused". "Oscar knows his face has changed and says 'my smile has gone, mummy'," Mr Donnelly added. Yasmina Villa-Lopez, a travel lawyer representing Oscar's family, said it was an example of a family being "severely let down". "It's clear that something went terribly wrong here and that all games like this must be secure and pose no risk of harm to children or any other holidaymakers," Ms Villa-Lopez added.